ST. PETERSBURG, Russia (AP) — Imagine having a team featuring Cristiano Ronaldo supporting Harry Kane up front, Philippe Coutinho pulling the strings alongside Isco in midfield, and Diego Godin the rock at the back. That’s the backbone of the best 11 players of the group stage of the World Cup, as selected by Associated Press staff covering the tournament in Russia. Despite his superb goal against Nigeria in a must-win match, there was no place for five-time world player of the year Lionel Messi given Argentina’s struggles so far, but plenty of soccer’s other high-profile names have delivered on their reputations on the biggest stage. Alireza Beiranvand (Iran) — He’s gone from being homeless and working in a car wash to keeping a clean sheet against Morocco, repeatedly thwarting Spain until an unlucky goal, and saving a penalty from Ronaldo as Iran nearly sent Portugal home. Others made more saves but holding the Iberian powers to a goal apiece sets him apart. Kieran Trippier (England) — A surprise choice as England’s set-piece taker, the right back gets the nod over line-mate John Stones for setting up more chances than any other player in the first round of matches and being a constant danger in the 6-1 win over Panama , assisting on one of the goals. Ivan Strinic (Croatia) — A solid and dependable left back who played a key role in keeping Messi quiet in the tremor-inducing 3-0 win over Argentina and was impressive at both ends of the field in Croatia’s opening win over Nigeria. Two games, two clean sheets. Diego Godin (Uruguay) — The indomitable leader of the only defense at the World Cup to keep three clean sheets . It reaffirms his status as one of the best center backs in the world. Can he keep it going against Ronaldo and Portugal in the last 16? Andreas Granqvist (Sweden) — He scored two penalties, and captained a defense that kept two clean sheets and put on a sterling effort against Germany that only fell short in the final seconds. 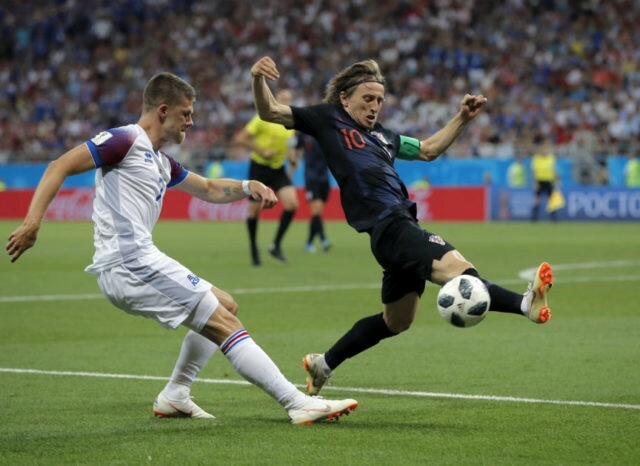 Luka Modric (Croatia) — He was instrumental in the win over Argentina, scoring one of the goals of the tournament in the process with a long-range strike. Also scored a penalty in his team’s opening game. A key reason why Croatia is considered a legitimate contender for the title. Philippe Coutinho (Brazil) — Finally putting in consistent performances at the international level from his position as the most attacking of Brazil’s three central midfielders. Even stole the limelight from teammate Neymar by scoring from long range against Switzerland, then the pivotal first goal in the win over Costa Rica. Also set up Paulinho’s goal against Serbia with a beautiful through ball. Francisco “Isco” Alarcon (Spain) — He’s Spain’s most influential and watchable midfielder , which is a feat in itself considering its embarrassment of riches in that area, with his creativity and superb technique. He also managed to get on the score sheet against Morocco. Harry Kane (England) — The tournament’s top scorer with five goals , adding an accidental hat trick against Panama to two predatory strikes from close range against Tunisia. With qualification in the bag, he didn’t play the third match. Taking on the England captaincy doesn’t appear to be a burden. Cristiano Ronaldo (Portugal) — Is he the GOAT? Well, four goals in his first two games, including a hat trick against Spain, have certainly boosted his credentials in that debate. With his winner against Morocco, he became the second-highest international scorer in the history of the men’s game, with 85 and counting. We’ll forgive him the penalty miss against Iran. Romelu Lukaku (Belgium) — He’s delivering the goods at an international tournament for the first time, with his four goals — two against Panama and two against Tunisia — coming from a variety of finishes in just two matches. Like Kane, he’ll need to repeat these exploits against tougher opposition but has made an impressive start.